Christy, Jana. Good. 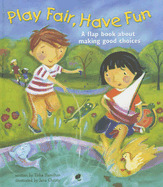 Play Fair, Have Fun: A Book about Making Good Choices by Hamilton, Tisha, 2007-09-11. Lift-the-flap book. Glued binding. Paper over boards. 12 p. Contains: Illustrations. Intended for a juvenile audience.